Hey, everyone (if there's anyone left). It has been nearly five months since my last full post, which is way too long. I apologize. I don't do thee justice. Nevertheless, there is always time for renewal and starting afresh in this earthly life of ours. So I come to you again two days before the start of NANOWRIMO. I have been participating in National Novel Writing Month three years running. My total number of words I wrote, over the three year period, didn't reach the coveted number of 50,000. I have tried short stories, a novel, and non-fiction. The intention of NANOWRIMO is to get us writers to write, to do away with our inner editor and just put down what's in our minds, as incoherent and ungrammatica asl it may be. It condenses a small novel (50k of words might be 3 chapters to George R.R. Martin) into a frantic period of writing, to stir creativity, since we have been trained by numerous teachers and college professors to produce our written work by a deadline. Deadlines direct and focus the writer, which is partly why you haven't read much from me as of late (shrug); I lost my writing rhythm and couldn't find the beat. So now I decide to step onto the empty dance floor to go all Kevin James in Hitch doing my thing without a care for what people think. Psychologically this is quite overwhelming. Fifty thousand words (putting numerals into words always helps) is quite a bit to write, especially when I'm used to writing in blog post and homily sized bits. Developing an idea or story over such a long span of writing seems insurmountable. I know it's not because I personally know people who have conquered it. But there are still lingering doubts. With all this in mind, I decided to slightly bend the traditional NANOWRIMO rules, which usually call you to write on one project. I chose to continue my current, or rather more comfortable, mode of writing, in short chunks. So I will switch between projects I'm working on, rotating through them. They are: this blog, my other blog, my homilies, and the non-fiction book I started last year on the theology of alcohol; 1,667 words per day on each subjext. Some days this might be more, other days it might be less. That length, however, isn't any longer than a long blog post. I think that is doable in my mind. I'm really excited about this and am looking forward to finally reaching that 50,00 word mark. 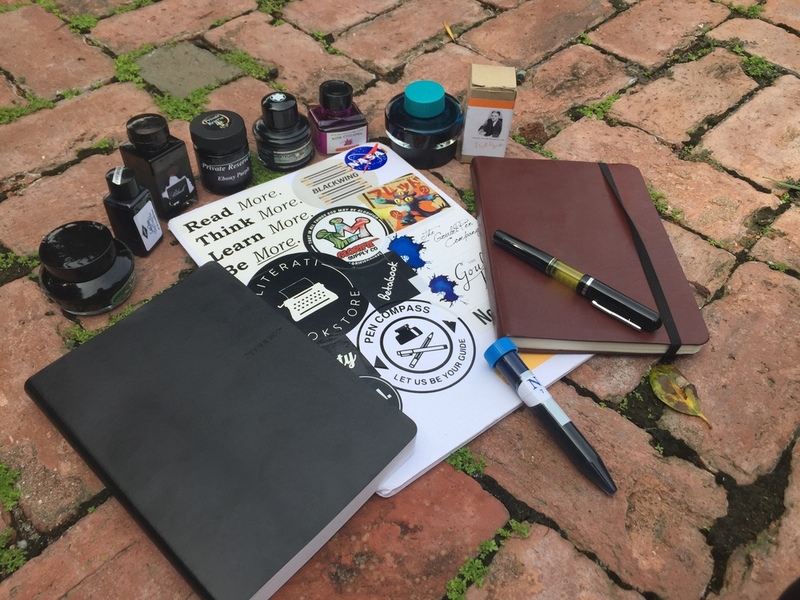 Being that I am a stationary snob and certified pen addict (Brad Dowdy how is this not a thing). My long journey in words will take place on paper as opposed to screen. It starts with the instrument. I saw an add from Conklin a few weeks ago in the latest edition of Pen World about three new pens the company produced recalling models the company made in its heyday nearly a century ago. One of the pens in particular caught my eye. Although it is gimmicky, I fell for it, hook, line, and sinker. A piston-filler, modern Conklin's first, the Word-Counter is, to my knowledge, unique among currently produced pens. It has, etched on the misty-yellow demonstrator barrel, levels to show how many words the pen has written through measuring the level of ink. This gives the writer some semi-scientific indication to the length of his writing. It seemed perfect for the NANOWRIMO endeavor. It says it holds approximately 5,000 words worth of ink, which would mean I'd be inking up the pen at the alarming rate of every three days. That's quite a bit of inking. I figured I would mark every filling with a different ink. This way variety can aid in inspiration. In monotony, I find difficulty. I chose nine inks to handle this, the whole course moving from dark and dull to bright and vibrant. I start the first three days with Aurora Black, a solid base on which to stand. Moving slightly off color, I will then turn to Private Reserve Ebony Purple, a self explanatory color, really. This will be followed by Diamine's Cult Pens Deep Dark Blue. These first nine days will cover a solid base of writing and gives me confidence to continue on. The next nine days starts with Sailor Jentle Epinard, which, although being a dark greeen, gives some sheen in comparison to the three previous matte colors. I will then enter the most difficult time in the NANOWRIMO month. I have chosen an ink to mirror the start of the dulling of my perception and the small ways in which, after approximately twenty thousand words, reality starts to waver, delirium not yet set in, but certainly walking up the street like a self-righteous proselytizer who perceives my weakening mind and body, this being Montblanc Meisterstück 90th Anniversary Permanent Grey. After which, I will fill in the grey hole with a matte, bright color reminiscent of leaves falling elsewhere in the country, Organics Studio F. Scott Fitzgerald. The final three days will grow in brightness, joy, and vibrancy. It starts with one of my favorite inks, which I will need after such a somber mind-month. Lamy Turquoise will brighten up my paper and give my writing some nice shades. With Organics Studio Nitrogen jumping up the vibrancy of the blue, my words will pop off the page. Hopefully, it will help words pop forth from my slowly tiring brain as well. To give me energy like that last cup of coffee at three in the morning the dawn a paper is due, I have chosen the inimitable J. Herbin Rose Cyclamen. A pink that, hopefully, will bring me to the finish line. 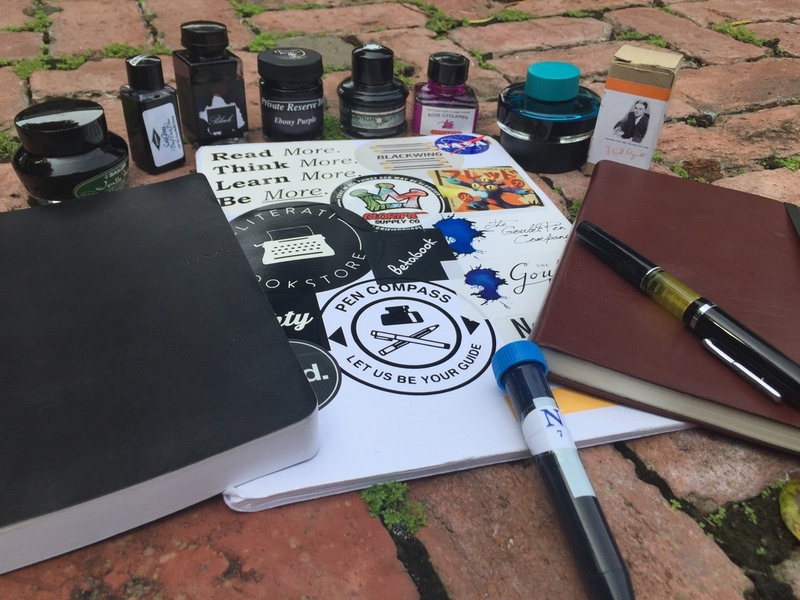 You might have noticed I only choose nine inks approximately leading to only 27 days of writing leaving three days unaccounted for. After my experience of pencils during Lent, earlier this year, I have incorporated them into my rotation declaring Fridays as pencil days, coloring them with graphite alone. Four of the thirty days will be ferruled by the pencil. The pencils used will vary from mechanical to woodcased, whichever is closest when writing. My tastes there are not yet sharpened. This year, I have done something I've never done in my previous three years, through the inspiration of Johnny Gamber, of Pencil Revolution. I sat down and mapped out a basic plan of the topics I would cover in the various projects, recording them in over 30 pages of a Field Notes Shenandoah, leaving 18 pages for notes and other things. This will be my companion through this scribal pilgrimage. It will be my map and my odometer. With it, I have three other notebooks, my Nina, Pinta and Santa Maria, each already assigned a task and therefore ramping up their workload for the month. I will continue using the Zequenz 360º from last year to expound on alcohol in a theological manner. I have been using and will continue to use as my homily prep notebook the Nock Co. A5 notebook, which has been covered by stickers. Finally, to develop my thoughts for both blogs I've been using, since May, the burgundy soft-cover and lined Monsieur Notebook. With all these tools on hand and a plan somewhat sketched, I feel more ready than ever to mount the heights of the Zion of post-modern writing, a NANOWRIMO win. Are any of you embarking on this NANOWRIMO journey? Let me know in the comments, we certainly need mutual encouragement. If you are, are you going analog or digital? If analog, what tools are you using? I am so grateful to have, two years ago, become a part of this wonderful community. I was judging a local cookoff last week and with the cookoff was a car show. I got to talking to one of the guys who had this purple pearlescent 30's sportster. It was a loud thing, and he was a big personality to boot. His father had built and rebuilt cars, so he had been going to car shows for a long time. They have their own community. He told me that a lot of times his friends don't understand why he continues to compete and go to car shows. They though him strange, but amongst "the guys" he's a little loud (I mean a bright purple and punk car!). I told him, "Dude, I understand. I collect fountain pen. My office staff tolerates my packages and giddiness. My family things it's strange." 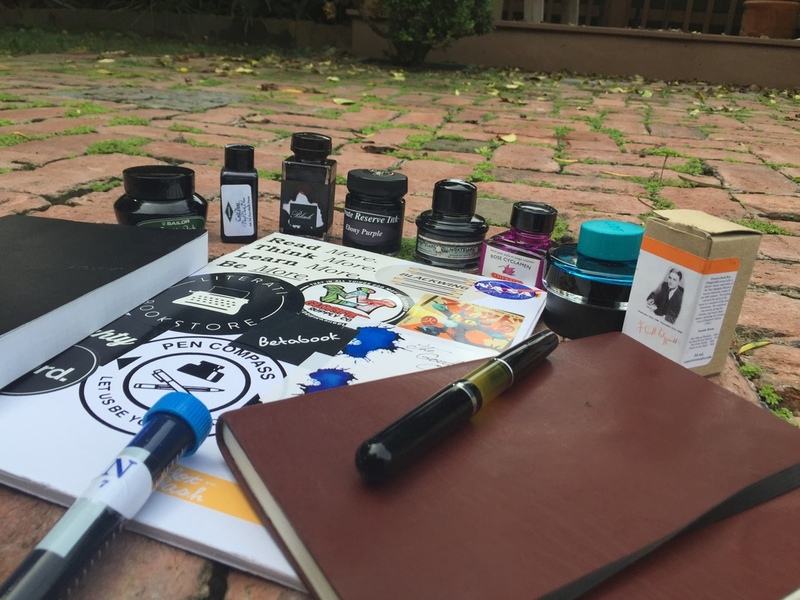 This community started with, and I guess remains unified by out mutual love of FOUNTAIN PENS, but is made up a fantastic persons. Person who generally care for each other, who, although we may enable each other, are often very gracious and generous. In the continued spirit of that generosity, I am hosting my first giveaway. I attempted to go on a fall theme jumping from the color of the pen, but here it is. Those three are probably my three favorite shading inks and together with the italic nib should be able to give the winner all of the colors of Autumn. This giveaway is going on both here and on my Instagram which is @colonel4God. So you have two possible chances to win. If you are on Instagram the rules will be explained there. This giveaway ends Sunday November 9 at 12 noon CST. After which I will choose someone at random using the Random Number Generator. I will post the winner here on the blog and on Instagram and he/she will have 1 week to respond before I choose another person at random. For the past two years, I have taken part in a writing phenomenon called NaNoWriMo, National Novel Writing Month. Started in San Francisco about 10 years ago, this event is intended to force the hand of the wanna-be novelist. The goal is to write 50,000 words during the span of the month of November. It is a whirlwind of creativity. That number, seemingly arbitrary, is about the length of a short novel. Although it might only be the prologue of a George R.R. Martin novel, writing that amount is quite a feat (one which I have failed at two years running). Most take on this endeavor with word processor and keyboard, but, as a pen person, I can't pass up the opportunity to use my toys. The last two years I have dedicated a pen, pad, and ink to this particular end. My Lamy 2000 and TWSBI Vac 700, both in fine nibs, together wrote 30,000 words (mind you that's 70,000 short of what they should have written), 10k and 20k respectively. The two previous years I used large 8 1/2 x 11 notebooks from Moleskine and Leuchtturm 1917. My lineup this year is heavy on my Dallas Pen Show purchases. As with the two previous pens, I wanted something with a large ink capacity and a small nib. My Franklin-Christoph Model 02 Intrinsic with Masuyama Needlepoint fits the bill. I can fill it as an eye-dropper with Iroshizuku Kon-Peki, and it'll hopefully write for days without needing filling. It will be kept snug and safe in my Bas & Lokes "Reynolds" Leather pen case. I decided to go with a smaller notebook this year because those large notebooks were too unwieldy for me and weren't a delight to write in. The Zequenz 360° lined notebook in A5 size is perfect. It can supposedly bend any which way, and it has 400 pages to take in all 50,000 words (hopefully). I've been using a pocket sized version of the notebook for the novel prep, and I've been enjoying the paper. Now that I've gotten all my material you're probably wondering the topic of my novel. Well, I'm not writing a novel per se but a work of theology and philosophy of utmost seriousness. I hope to expound on the theology of alcohol. I do hope to incorporate my blog writing both here and elsewhere into the word count (a little bit of a cheater, but I'm still writing 50,000 words! ), but my posting frequency might lessen some due to output elsewhere.